Every week thousands of diners head to curry restaurants the length and breadth of Britain to tuck into a Balti. The famous dish is widely thought to have originated in the Sparkbrook area of Birmingham in the late 1970s and first cooked by immigrants from Kashmir. 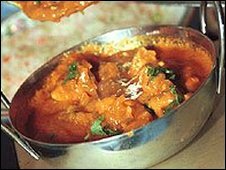 Now the city council is considering a bid to have Birmingham's special claim on the Balti name recognised. If successful it could give the distinctive curry "protected geographical status", like Melton Mowbray pork pies, Wensleydale cheese and Cornish clotted cream. Birmingham is home to the famous Balti Triangle, the name given to the areas of Sparkbrook, Balsall Heath, Sparkhill and part of Moseley where about 30 restaurants specialise in the dish. Balti translates literally as "bucket". Round-bottomed Balti pans, similar to woks, were first used by people in Baltistan, Pakistan. The ingredients for a Balti are not dissimilar to other curries, but for the last 10 minutes the contents are cooked at high temperatures in the special dishes. Fresh spices, herbs and chillies added during the final stages of cooking gives the food extra colour. Baltis are also set apart from other curries in the way they are presented to diners. They are eaten straight from the dish, rather than from plates, usually with naan bread to scoop up the meat and sauce. 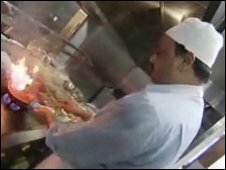 Mohammed Ajaib is credited by some as serving Birmingham's first Balti in 1977. But Andy Munro, spokesman for the Asian Balti Association, said it was not known who created the original. "A restaurant owner decided it would be a good idea to cook something that satisfied the Western palate but was served up in a way that would be popular with the Pakistani community - it's a hybrid dish," he said. "In Pakistan typically you would get something cooked-up in a karahi - a type of bowl - and it would be slow cooked on the bone. "The difference in Birmingham was they decided they needed to commission something where you get fast cooking off the bone." Other areas, including the Curry Mile in Rusholme, Manchester, and Brick Lane, in east London, are famous for their south Asian cuisine. But Mr Munro, who is part of the team bidding to have the Balti name protected, said all evidence pointed to Birmingham as its birthplace. "People misconstrue Balti as being a dish with a very specific recipe. 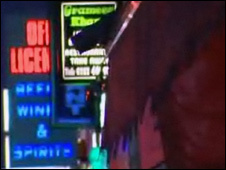 It's a complete mirage that you can buy a Balti sauce." He said Balti was a distinctive style of cooking, rather than a particular recipe. "There's lots of pretenders and we need to nail it properly [for Birmingham]." Baltis are traditionally served in the steel dish which they are cooked in. Tanveer Choudry, owner of Punjab Paradise, in Ladypool Road, said he thought officially recognising Birmingham's claim on the Balti name would be a "brilliant idea". Many Balti houses traditionally asked customers to bring their own drinks and Mr Choudry's restaurant, which has been in his family for about 30 years, still does. "I'm a traditionalist at heart and I think Baltis should be served in a steel dish with naan bread and as little rice as possible," he said. Mo Ahmed, whose family have run Al Frash, also in Ladypool Road, since 1992, said too many "Balti" restaurants were not true to their heritage and served meals on plates. "We are trying to revitalise the originality that's been lost," he said. "A lot of the changes are for the convenience of restaurants rather than from customer demand."